We chat with Ubisoft Shangai's Michael de Plater about making shouting at your TV a good thing, and how Pandemic nearly beat the team to the punch. Kikizo: It does feel very different. It doesn't just feel like a real-time strategy game. I think if you put me down in front of it, I wouldn't say, Oh this is a real-time strategy game. De Plater: And that's because it's a war game and not just a strategy game. Kikizo: How early was the brand attached to the game? Kikizo: From inception? So you didn't have a gameplay idea and then build the brand into it? 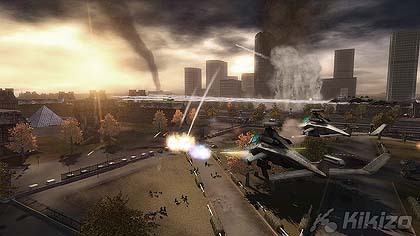 De Plater: Actually, I was at the end of Rome, and I wanted to do a console war game and I wanted to do modern warfare. It's very dynamic and mobile and stuff. So I knew that. I wanted to do a modern console war game. 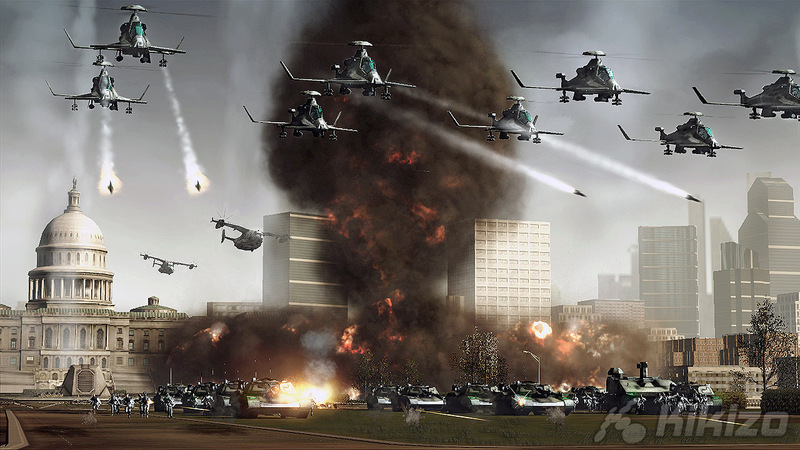 And Ubisoft wanted to do a Tom Clancy game, so as soon as I spoke to them it was a very natural fit. In terms of the mechanics, basically it's a real-time version of the Warhammer 40000 tabletop game. To me this game is more like Warhammer than Warhammer 40000: Dawn of War is. Dawn of War is the Warhammer universe mapped on to a traditional RTS, where you have building and tech trees and whatever, whereas ours is very much a tabletop war game mechanic as a real time game. Kikizo: Did you experiment with any other control mechanisms? De Plater: Yeah, we did. We went through a few iterations of the controls. There are two things to that. One, we thought about the voice commands right from the beginning but we didn't build the game assuming it was going to work, because we weren't a hundred per cent confident. Rainbow Six had had some voice command and it hadn't worked so well and even in SOCOM the reliability wasn't enough, so we knew we couldn't assume that we had to have the voice command even though we knew we were going to try. And the other thing, initially, we didn't have the dashboard along the bottom with the D-pad, we had an analog method. So you could use the right stick to move to select any unit at any point on the battlefield. It worked really well. There was no problem with how it worked, it was just the learning curve was high. Whereas when we put the D-pad and then we put the dashboard and then we let you navigate the dashboard, the accessibility was a lot higher. Kikizo: You were talking earlier about doing focus groups and trying to make the game as accessible as possible. From the brief time I've had to play it, it seems there's quite a learning curve. It's the kind of game that if you sit down and play it for an hour and a half, after you've put in that time, you'll think, This is easy, it's straightforward, it's natural. What are you going to do to make sure people get through that first 90 minutes? De Plater: it's really to have the story missions gradually introduce it. So we've got a six-hour singleplayer campaign. It's that very, very fine line between having a learning curve and letting the player learn but not giving them tutorial, because tutorials are boring. We're going through that process at the moment. Actually, that is something I think Company of Heroes did exceptionally well. The story missions in their singleplayer campaign had a really nice ramp up. So it really comes down to that, to teaching in the singleplayer. 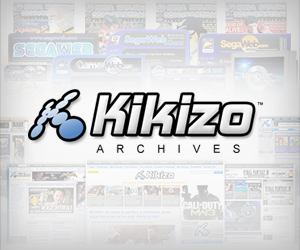 Kikizo: Have there been any major changes in the last year or two? If you look at the Xbox 360, it's only been out for two and a bit years, and you started quite a bit before the console even came out. So has the success of the 360 changed anything you've done? Like, there are headsets packaged in, so did you say, Okay, everyone's going to have a mic, so we can really focus on voice commands? De Plater: The first thing we did three years ago was we made a fake gameplay video and it looks remarkably the same as what we've now got. To be honest, at the beginning the vision was a giant Ghost Recon or a giant Full Spectrum Warrior, because Full Spectrum Warrior, in terms of the controls, was exceptional. It was a really well-designed game. The only problem is that the actual game itself of just two squads is a bit dull. 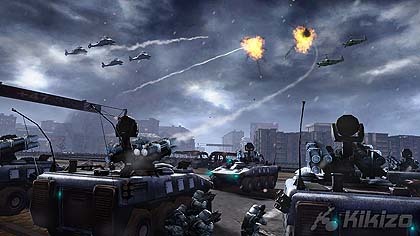 It's so weird to have Pandemic as the company that did Mercenaries and Star Wars Battlefront, they can do these really exciting action games, and if they had brought a little bit more of that to Full Spectrum Warrior and they had made Full Spectrum Warrior large scale, then they probably could have got there before we did. They would have been our major competitor. But the sensibilities of Star Wars Battlefront and Full Spectrum Warrior never quite came together. Star Wars Battlefront has that campaign system, the way you go between planets, and the mission system - it's quite a lot like what we've got. I don't think our competitors are Halo Wars and C&C. Our competitors are like Battlefront. It's funny because EA is now working on [Command & Conquer spin-off] Tiberium, and Tiberium is much more like this than C&C. 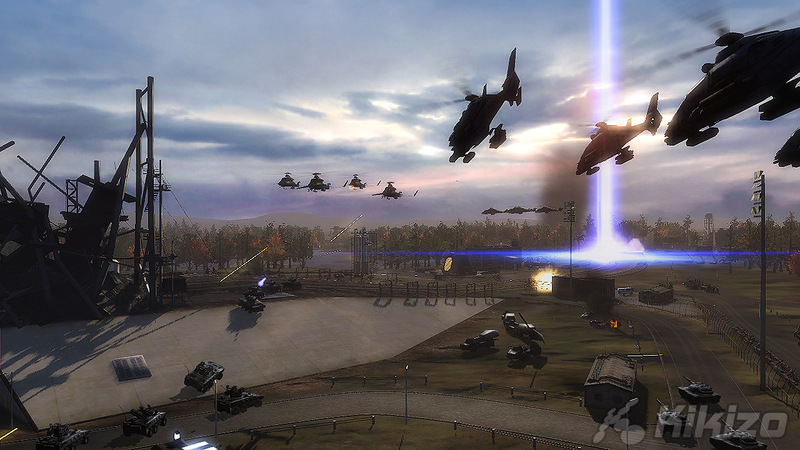 You have a character and you control multiple squads, you call them in by airlifts, you capture strategic objectives, or Quake Wars where you're airlifting in stuff and building placements. These sorts of increasingly big-scale war games are much, much closer to the spirit and much more like competitors for us. EndWar will be out for Xbox 360 and PlayStation 3 later this year.